Failte go dti cumann C. L. G. DubhÃ¡th bunaithe 1891. TÃ¡ an club ag freastal ar foirne faoi 8, 10, 12,14,16,18 21 soisear agus sinsear comh maith le iomÃ¡naÃ­ocht. Chomh maith le seo tÃ¡ foirne na gcailinÃ­ faoi 10, 12, 14 agus 16. Ta bÃ©im mhÃ³r ar an cultÃºr trÃ­d pÃ¡irt a ghlacadh sna comortaisÃ­ ScÃ³r Bain sult as na cÃºpla focal anseo agus mÃ¡ tÃ¡ smaointe no tuairimÃ­ ar bith agaibh faoi bÃ­ i dteangmhÃ¡il linn. Duagh GAA club can trace its origins back to 1891 shortly after the formation of the GAA when football or âcaid' as it was then called then was played in the area. GAA as we know it now was very different then and not as well organised. The GAA was formed in 1884 and Duagh was quickly literally in the field nurturing the values and traditions of the GAA. The people of Duagh have always been most supportive throughout the years, through difficult times and good times and the club would like to pay tribute to all those who gave of their efforts through the years. In the early years matches were mainly inter district with some challenge games with neighbouring parishes. Then with the formation of Divisional Boards and the North Kerry Board 1924, Duagh was one of the 6 clubs affiliated and from then on leagues and competition became the vogue. Duagh took part in all those leagues senior and junior but victory did elude for a while. Those were difficult times. It was after the War of Independence and the bitterness of the civil war was still about and in our fledgling country money was scarce and emigration was rife. The Duagh colours are maroon and gold but it is said that in the late 20's Duagh wore all white jerseys to honour the great Kildare team of those years first winners of the Sam Maguire Cup. St Bridgid the patron saint of Kildare is also the patron saint of Duagh, the church and the school. Indeed the church and Duagh GAA has many other connections as well. This is said to have been the link. Duagh was in those years a leading parish in the diocese for vocations and the team usually had four or five students as players. These student players were on their way to the priesthood. When Duagh reached the first North Kerry final v Moyvane in the early thirties these students had returned to study in September and were not allowed out to represent Duagh in the final. Unfortunately then with a depleted team which was also now minus the captain away due to work commitments the Duagh team was well beaten by a Con Brosnan inspired Moyvane. After this disappointment and with absent students and emigration the Duagh team became depleted and some players began to join neighbouring teams. This left the Duagh team playing in the more junior competitions. In 1934 a serious attempt was made to organise. The absence of a playing pitch was a real handicap. It was decided to rent a field in Lybes near the village for training. Indeed the present field is also in Lybes. With a playing field available the club decided to organise a parish league. Parish leagues are great and even though they can generate hassle and a little bloodspill they often generate good teams. This was also the case in Duagh and there were decent teams in the area in the late thirties and forties. Major success still continued to elude the club but the seeds of success had been sown and in the fifties Duagh GAA club began to enter a great era. Many stories have been told of the great battles Duagh had with Clounmacon, Ballydonoghue, Listowel etc. Duagh finally won the North Kerry title in 1951 and again in '55, '56, 60 and 62. This was indeed a golden era for the club. Sadly the club, though going close a few times has not won the North Kerry title since. The 1960 team: (not in line out), Billy McCarthy, Timmy J Brandon, Dan McAuliffe, Pat Dillon, Jack Buckley, Fr Vincent O Connell, Matt Dillon, Dan Keane, Tim Nolan, Brendan McKenna, Pat Joe Heaphy, Tom Nolan (capt), Billy Doran, Patsy Larkin, Patsy McNamara, Kevin Dillon, In 1955 three of the Duagh players were members of the Kerry team panel that won the All Ireland that year. Tom Costello is with us and in good health but Dan McAuliffe and Diarmuid Dillon have gone to their heavenly rewards. Many other Duagh players from those years have donned the Kerry jersey or have worn county colours with their adopted counties. Billy Doran of course played senior with Kerry but unfortunately injury curtailed his footballing career , the Stacks Leo and Gerald, Con Buckley, the Dillons (brothers of Diarmuid) Pat and Kevin (Cork), Patsy Larkin Kildare, J M Heaphy Wicklow. There were many other great Duagh players spanning the years from the late forties up to the early sixties, too many to mention here with the added risk of leaving out some so they will be left for a more comprehensive Duagh GAA history. Alas most have gone to their rewards but they were great and we do remember them appreciate them. As the sixties drew on many of the former players had retired and it was time to build a new team. It was going to take time to replace those players and rebuild. The seventies came and the County League. The club was not doing too well in North Kerry but was doing reasonably well in the county league. Promotion came from Division 4 to Division 3 and promotion again to Division 2 Unfortunately the club could not hold its place in Division 2 and was relegated to Division 3 and after a few years down again to Division 4. In the eighties a separate Board na nOg cumann was formed. Many new faces joined the cumann. A parish league was run and again from this came the fundamentals of the next senior team. The team began to gain prominence in again in North Kerry in the 90's but again the major titles were eluding the team. In 2002 the senior team won its first county title - The Kerry Novice Championship defeating Listry in the final. The club did very well in the Millennium Cup being finally defeated by Milltown/Castlemaine. At this stage the club had upgraded its playing field to all weather grounds. There had been several developments to the Duagh GAA grounds over the years at huge cost but none seemed to work and the Duagh GAA field was one of the poorest in North Kerry. This latest development solved the problem. The club purchased and developed more land adjacent to the present pitch and now has 5.3 acres with 2 playing pitches with floodlights for training. It is now said to be one of the best playing pitches in the area. In 2006 the team under the management of John Dillon began to go places. Gradually and quietly the team began to progress through the Kerry junior championship all the way to the final v Renard. We were the outsiders in that final but on a dreadful day in Tralee Duagh won the junior championship. This was serious stuff; we had seen what Ardfert and Finuge had done, could we dare to dream? We hadn't won the North Kerry championship since 1962 and here we were Kerry champions. We progressed through Munster without much difficulty until we reached the Munster final. We played Adrigole of Cork in the Munster final in Fitzgerald Stadium Killarney on December 23rd 2006. Again we were regarded as outsiders that suited us very well. It was a beautiful frosty Saturday afternoon and the sun set bright red west of Killarney and we brought the Munster cup to the Mall Road after a great tussle with the Cork champions. It was the night before Christmas Eve with everybody on holidays but most of our exiles were in Duagh that night to celebrate the winning of the Munster title. In February 2007 we defeated the Leinster champions from Laois in the All Ireland semi final and the dream was becoming a reality we were on our way to Croke Park. The atmosphere in Duagh those times is best left to your imaginations but it was great. We were the first GAA club to play under lights in Croke Park and it was the week after the Ireland France rugby game. We didn't win, we lost to a Tyrone team Greencastle by one point but they were great times and we look back with nostalgia. In modern times we have Anthony Maher at midfield on the Kerry senior team and both he and Kieran Quirke won senior All Ireland medals with Kerry in 2009 In 2012 Kieran Quirke was corner back on the Kerry junior team that won the 2012 junior All Ireland defeating Mayo in the final. 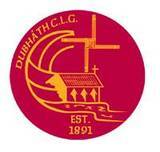 Duagh Juniors, the Duagh B team has tasted success regularly in recent times. The team has won the North Kerry league on a number of occasions and success has also come in the county leagues. County Urban leagues have been won and last year Duagh entered a âC' team which won the North Kerry league. Of late emigration and loss of employment has hit the club. Changes are always happening and now only 6 players remain from the team that played in the All Ireland club final in 2007. Unfortunately many of these players are absent through injury. In 2012 Duagh found it difficult to field a minor team in the North Kerry league and joined up with Finuge. The club takes part in every age group from 6 to senior male and female and of course we also have a hurling section within the club. There is great spirit and dedication in the area and we are blessed with some of the best supporters around. 44 Appearances (10 Championship. 32 League. ) Also played 1 U21 games. 2 Duagh players represented Kerry at U21 grade (2000-2010). 1 Duagh players represented Kerry at Minor grade (2000-2010). Eoin Kelly has represented Kerry at minor and U21 level. There were of course many other players from Duagh representing Kerry at minor and Under 21 level prior to 2000 and as soon as this list is finalised the complete list will be published here.